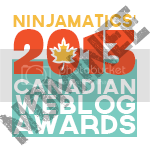 This is my unsuccessful entry for the 2014 CBC Nonfiction Short Story Contest. Their loss is your gain. Please to enjoy. Late afternoon, and amber light from a cloudless sky is mirrored in thousands of dandelions littering the field of cool park grass. Wind tugs at my hair and bites at the flesh of my cheeks. The scent of leather triggering a hundred fragments of memory, I reach into my old glove and curl my fingers around the seams of the ball. Tightly woven threads rub against each ridge of my fingerprints. What’s it to be – a curve, a slider, a non-athlete’s approximation of a ninety-mile-an-hour fastball? “You ready?” I call out. A short distance away, my son waits. His glove is brand new. A week ago a plastic tag hung it from the chrome arm of a store display. It’s stiff, immaculate, ready to be infused with history. And he’s not holding it right. “Up and open,” I tell him. Awkward fingers reorient themselves to the pose he thinks I’m asking for. He doesn’t really want to be here, I can tell. But he’s trying because he knows this is important to me. I nod, wind up and release. Perfect pitch. Nolan Ryan would be envious. The ball sails towards him. My boy reaches up and closes the pocket too fast. The ball bounces off the edge of the mitt and tumbles into the weeds. I’ve never purchased a glove for myself. The one I’m using, the one I’ve always used, is my late father’s. I used to have a smaller one, until I grew into his. Just like his suits, the first ones I ever wore. As ridiculously out of style as I must have looked, they had a reassurance to them. Slipping my arms into the sleeves was like feeling his around my shoulder again. My son doesn’t feel that way about my things. Because until only a few short months ago, he wasn’t my son. There is something of a skewed, Hollywood perception of what happens after you adopt an older child, particularly one who’s spent most of his life in and out of foster care. I’m thinking of the end of Face/Off, where John Travolta’s character brings home a kid adopted from the terrorist he’s just killed. The rest of the family embraces the boy, the music swells and the credits roll, the happily ever after securely in place. Integrating our new son into our family has not been quite so instantaneous, and it has certainly been devoid of any triumphant orchestral music. In preparing yourself for taking on an older child, you can rationalize until your brain oozes out your ears: Of course it’ll be different than giving birth to our own baby, but that’s fine. It’s okay that we don’t get to name him, or see his first steps, or hear his first word. We’re giving a home to a child who needs one. And at least we’ll never have to change diapers. The trouble is, your brain can accept these facts, but your heart, not so much. You can’t steel yourself with intellectual arguments against what you’re going to feel. When your new son sits at the dinner table with you and all his stories, all his memories, are of another life that you weren’t in. When he says “my dad” and he’s not referring to you. You feel like you’re babysitting someone else’s child, this well-mannered little stranger whose stay with you seems to be going on a while. And the very worst part is that this is normal, it’s no one’s fault, and there’s nothing you can do about it. It just is what it is. He tosses the ball back, and I scoop it out of the air. I catch a scent of my glove again as I wind up, and I think about the man who should be here with us and who isn’t. I lost my dad when I was 11, and I adopted my son when he was 12. I’m going to be presiding over this boy’s teenage years with no road map, no example to draw from, not a solitary conception of what it is I’m supposed to do. He’s taken off his glove to adjust his sunglasses. I’m so lost in insecure reflection I don’t notice. I throw. Roger Clemens. Down and away. In the general direction of my son’s face. An explosion of tears, and my wife runs to his side. With each choked sob a crescendo of guilt rises within me, the creeping and admittedly hyperbolic sensation of being the worst father in the world. It sure ain’t like the movies, I think to myself. Too many people in the world have made this boy cry. Too many have disappointed him, failed to meet his basic needs, even abused him in moments unthinkable. He wants so much to be happy and the world keeps kicking him while he’s down. Now his new father has hit him in the head with a baseball. One more chorus of pain for the cacophonic dirge that has been his life to this point. My father made me cry when he went away. When my mother told me that he’d died, I shattered. Like the neighbor’s window met by a carelessly tossed ball. My soul was broken shards on cracked earth. It has been nearly thirty years gluing it back together. Tears dry, but my son doesn’t want to play anymore. We gather the gear and proceed home in a heavy silence, broken only by the roar of cars passing on the street. Once inside, he tosses his glove aside and hurries upstairs to the sanctum of his video games. There are aliens to destroy and princesses to save. My wife tells me not to worry about it. She’s right, of course; it was obviously an accident. I’m not there anymore; I’m trying to recall the very last time I played catch with my dad. Memory is uncooperative. No bars, no signal. Only a gray blur. It was likely a moment to which I assigned no special significance at the time, because it was one of a thousand, and I wouldn’t have suspected there wouldn’t be a thousand more. So it is lost in the mists, forever. It occurs to me then that it won’t be long before my son doesn’t remember this day either. That maybe he’ll have the vaguest of recollections when he looks back from fifty years’ distance. If I’m still around, and I remind him, he’ll laugh at the old man for dredging up such a silly reminiscence. It’s not the golden, soft-focus Field of Dreams moment we’re promised by the movies. It isn’t even a collection of moments so perfect they might have been choreographed for maximum impact on the heart. The smiling pictures we post online for our friends to envy. It’s the work we put in one day to the next, through seemingly endless bouts of frustration and failure and feeling like the last people on the planet who ever should have been approved for parenthood. It’s not in how we throw the ball, or even that we make the time to throw the ball back and forth whenever the sun shines on that field of dandelions. Our boy was falling, but we caught him. He’ll stumble often throughout his life, but we’ll catch him. Even if he never truly loves us the way a son is expected to love his parents, we’ll catch him. One day he’ll be ready and he’ll want to throw the ball to me. 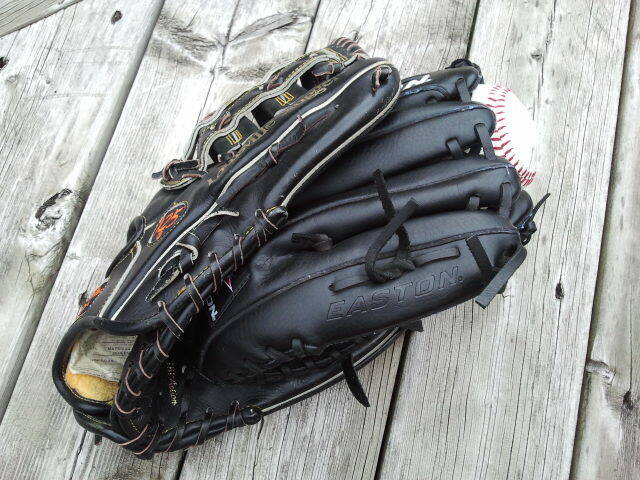 With my father’s glove I will catch it. With a father’s love, I will catch him. Previous PostPlease Welcome… Emmie Mears and The Masked Songbird!Next PostThe Versatile Blogger Award! Damn Graham , you brought tears to my eyes. Well done . Wow! I have to guess the CBC must have had a difficult time rejecting this for some other submission. Having had the privilege of calling your dad my best friend, this blog brought back many happy memories – and the pain of losing him far too early. It also made me reflect upon my resumption of early fatherhood as my stepson was part of the bargain when I married his mother. Come to think of it, I’ve rarely called him “stepson” in the past 28 years: he’s my son as surely as yours is yours, even though his natural father is still an important part of his life. For me and mine it took some years for our relationship to develop the depth and importance that feels so natural now. In acquiring you and your wife as his new parents, your son has won the lottery. There’s no telling if he’ll ever really want to play catch – mine never did – but the relationship is so much more important than the activities we use to cultivate it. It’ll happen. Just wait. Thank you. And that is dad’s glove in the picture, holding onto his grandson’s. Touching story that made me think about my own family. Very strong ending The father and son catching is a universal experience that every father and every father’s son has strong feelings about.. I do not enter contests. except one. Every year I have a one in 7,000 chance of winning it. Every year I think I’m going to win. When I don’t, I’m surprised. I’m waiting for that one judge who will say, “This is a masterpiece. This rivals Tolstoy.” Maybe next time. Thanks very much. To be honest, the response to this story and some of the lovely comments (from both friends and strangers) are of much more lasting worth than a cheque and a letter of congratulations from an anonymous judge. Thanks for sharing Graham – wonderful! Just wow. And you know I think you and your wife are both amazing people. Everything you say here is so true. So on the money, but told with such style and a lovely metaphor at the end. I actually laughed at the part when the baseball hit your son in the face! (sorry) Not because I’m a masochistic child hater but because it was such a REAL moment. It so isn’t like Field of Dreams! But when things like that happen and your child is adopted and has been through trauma, your natural instinct is to prevent any trauma at all befalling them. Anything. And then we beat ourselves up when we yell at them to tidy their room or eat their food up! And yes, we’ll be there to catch them even if we too stumble. Thanks for sharing this Graham. Their loss entirely. Thank you Jo. Yes, there are times when we both feel like we are having to overcompensate for the decade of neglect and bouncing through the foster system that was his life to this point, and any stern words or consequences must be weighed against potential triggers of past traumas and such. But he’s an amazing kid and we’re lucky to have him in our life.